The Wizard of Oz is gearing up for its 75th Anniversary, which among other things, makes the film very old and in desperate need of a touch-up. Not only is the film and sound getting digitally enhanced for the anniversary, but Warner Bros. is also putting together a 3D and IMAX release of the film, that will then be brought to Blu-ray 3D, Blu-ray, DVD and Ultraviolet on October 1. You won’t even need a wish or a magic pair of ruby slippers to get your hands on a copy. 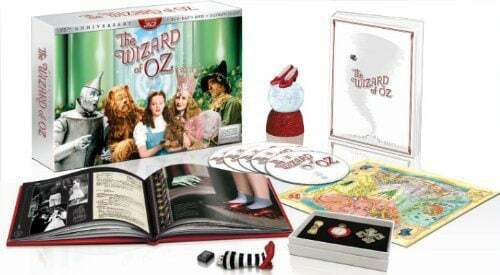 While the family film will be available in numerous additions, including good old regular DVD and Blu-ray sets, the The Wizard of Oz 75th Anniversary Collector’s Edition is the real reason for the release, especially since the home entertainment company has put together some pretty epic Wizard of Oz sets in the past, including a pretty spectacular 70th Anniversary boxed set Blu-ray. Reports have indicated for several months that The Wizard of Oz would get a 3D release, and earlier this week, Warner Bros. made the official theatrical announcement. What the Blu-ray 3D set will offer that the theatrical event won’t is a bunch of brand new extras. Of these, the most exciting is probably the brand new documentary about how a troubled production ended up creating an iconic film. Other brand new extras in the Collector’s Edition are memorabilia-based and include a ruby slippers globe, a journal, a pin (not to be confused with “pen”), a map, and full-color book. That’s a lot of goodies to be found on the yellow brick road; however, like other expensive sets, it will cost you. The Wizard of Oz 75th Anniversary will cost $105.43 SRP, while a two-disc 3D Blu-ray will run for $35.99 SRP, a one-disc Blu-ray will cost $19.98 SRP, and a two-disc DVD will be available for $16.95 SRP. All the details aren’t fully available yet, but here’s a look at the cover art.